My First experience with Mineral Hygienics and it was fabulous! I don't have words to express my feelings when I first used this. I was expecting maybe it will look like powdered on my face or it will dry my skin, but All of these negative points lead me to positive. I found it opposite. Everyone can find little tricks for using it. It doesn’t make my skin dry and or look powdery. I also dip my fingers into water and applied all over my face just once and it was giving me liquid foundation look and the most important " it has long lasting Quality". The one I loved most was " Cool Kiss Mineral Enhancer" Totally loved it. I have gone to every makeup counter in the mall. I have tried them all and I have never come across anything as good as Mineral Hygienics. I finally found a match for my skin. I am very fair with a red tint to my skin, sensitive and acne prone. It is so hard to find makeup that works for me but I have finally found it in Mineral Hygienics. First off, I would like to thank Mineral Hygienics Customer Service. Not only are Mineral Hygienics products amazing, they also have a great team that provides excellent customer service. they are non-comodegenic, hypo allergenic, anti-inflammatory along with many more benefits is something that no other foundation that I have used has, nor give me such amazing results. I am hooked! I will be recommending Mineral Hygienics to my friends, family and clients! I stand by them 100%! Thank you so much for such promising products that work! Flawless perfection! Beautiful! BRIGHTER, FRESHER WITHOUT BEING OVERPOWERING! Thank you Mineral Hygienics for that GLOWING HELLO LOOK that says, "HELLO WORLD, I'm ready to FACE the day with confidence"! Erica, you are one of the best, "Cosmetic Coaches" out there, thank you for the detailed personal attention, it has been a real treat working with you! You have won my business! My skin is very sensitive. I've been looking for years and years for make-up that works for me without causing skin irritation, itchiness, breakouts, over-drying, allergic reactions or eye irritation. The best I could do was to use Bare Minerals. But, even BM eye shadows, concealers, matte products, bronzer and mineral veil caused varying degrees of discomfort. I tried other mineral products--but they were much worse. Until now. I am so relieved! I love Mineral Hygienics! The coverage is great. It lasts and looks fantastic. But most of all, I can use it without any discomfort. It's like someone finally heard me and answered my prayers. I have what I want without settling. I feel good about how I look and just feel good! THANK YOU! Ever since I started using Mineral Hygienics foundation, I haven't looked back. My skin looks so flawless! It covers fine lines and dryness and gives a healthy glow to my face. Its long lasting and provides sun protection. The best thing is that its 100% natural! I absolutely absolutely love it! I received my Mini Starter Kit today, about a week after I ordered it. I live in Scandinavia, so that was fast! I used Bare Minerals in the color Light, so I ordered light and fairly light in the starter kit. I think the light is the closest to my skin color. The brush smelled of plastic so I washed it with shampoo. I used the fairly light around my eyes and the light on the rest of the face. Amazing coverage! 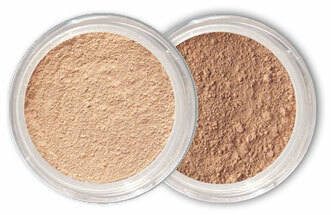 Compared to Bare Minerals it is less "sparkly" and more on the matte side, but not cakey at all. It stayed on all day, and I did not scratch my face once! I have sensitized skin, so thatâ€™s usually a huge problem for me when using foundation. All in all: love the brush, and love the foundation! Finally long lasting makeup, I really loved the foundations! I'm 15 years old, my skin is combination and as many other teenagers, I get acne. After getting acne, I get scars, and lot of them. In 2010-2011, I used a foundation that caused me serious breakouts, and I had to visit the doctor for medication. It was bad. My mom told me to quit using makeup because of all the bad ingredients you'll find and what caused me the acne problems, and I quitted. I've got a lot of acne-scars in my face, and nothing helps. Late in 2011, I discovered "Mineral Hygienics", and I read a lot about it. I told my mom about the brand, and she read about it too. She "approved" it for me, and I got a set from "Mineral Hygienics". After starting using it, my acne disappeared. It caused me ZERO breakouts, and if I get acne, it's just two or three small ones. It was GOOD for my skin, and it did hide all of my scars! etc., and it does! I train a lot, so it was fantastic for me to finally find a makeup that stays on my face and don't pour down while jogging or other training. I fell in love with it, and I still am. I just ordered the full started kit although the shade is to dark for me, I'm exchanging it out for the fairly light, and fair, but when I put it on my face I love how well it covered my imperfections, I love how sleek and nice it went on not cakey. It hasn't really helped with my oily skin like I was hoping it would. But so far I love this makeup and can't wait until I get my right color shipped to me. I love this foundation! Having previously used BE I knew what to expect from mineral make-up, however Mineral Hygienics blew me away. I will use it forever!